Field season has started at EastGRIP - The East Greenland Ice-core Project. Gaining new and fundamental information on ice stream dynamics from the top of Greenland. The 2016 EastGRIP season has started. On April 22nd, the first field operation managers made their way to Kangerlussuaq to open the field office. The first field team arrives in Greenland on April 25th and was put in at only -5C-very warm for the season. However the warm put in temperatures made for a perfect runway, and has allowed for a great start on the 2016 field work in Greenland, which will be visited by multiple ice2ice researchers during the 2016 season. The daily progress of the 2016 EastGRIP field season can found here: Field diaries. The East Greenland Ice-core Project – EastGRIP – aims to retrieve an ice core by drilling through the Northeast Greenland Ice Stream (NEGIS). Ice streams are responsible for draining a significant fraction of the ice from the Greenland Ice Sheet, and we hope to gain new and fundamental information on ice stream dynamics from the project, thereby improving the understanding of how ice streams will contribute to future sea-level change. The drilled core will also provide a new record of past climatic conditions from the northeastern part of the Greenland Ice Sheet which will be analysed at numerous laboratories worldwide. The project has many international partners, amongst these UiB also part of ice2ice and is managed by the Centre for Ice and Climate, Denmark, which is also part of ice2ice with air support carried out by US ski-equipped Hercules aircraft managed through the US Office of Polar Programs, National Science Foundation. The EGRIP camp was opened 27th of April at 12:00 by 7 people. The big main building, the Dome was found intact, garages were in good shape and access was easy. Temperatures were high and most of the vehicles started easily. Due to high temperatures and a significant amount of new snow, the plane was not able to take off and the crew helped opening camp for that reason. For å klargjere for iskjerneboring blir det gravd ut djupe renner i isen. Grooming of the skiway began at 17.00 and was continued into late evening. The 109th stayed overnight, while the snow on the skiway hardened. Next morning, the plane took off without problems at 6:30. Overnight, the temperature had dropped significantly. The first days were as always busy with a lot of small tasks; grooming the skiway, setting up skiway markers, getting an overview, and making all necessities available (outhouse, cooking, heat). The main generator was on at 16:00 (local time), four hours after arrival. The camp has two snowblowers, 3 snowmobiles, a Caterpillar and two Pistenbullys to help with large amount of work needed to build an ice core camp intended to last more than 4 years. The first couple of weeks have been heavy work! The plan to dig trenches and use ballons to make structures under the ice for working has worked perfectly. Now the big task is done: All balloons are now buried under several meter snow, and the snow surface is flat again with only a few ventilation shafts and hoses sticking out of the snow. A few bamboo flags mark the site of the days and nights drama. 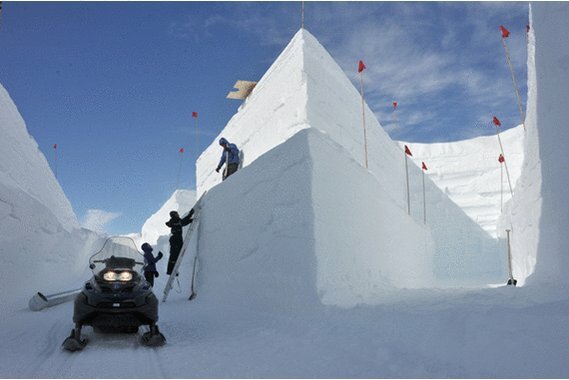 Trenches are neccesary to perform ice core science. They provide a perfect cold environment with the mean temperature of the site of about -25C. In these caves under the ice, a drill will be set up in one of the caves and the science will take place in the other. The season will continue and by 3rd of June another 4 flights to camp are planned. They will bring new weatherports, beds, tools, shelves, generators and spareparts all have to be installed and is used to complete the EGRIP camp so it may house 35-45 people.However the maximum camp load this year will be just 22 people. The work will continue by outfitting the science trench and drill trench with workshops, laboratories, control cabin and power. Further scientific sampling is done above ground, including snow property sampling, installation of a tower for water vapour measurements, surface movement measurements by GPS and many other. The winch and tower used for deep drill will be installed and we even expect to have time for some distinguished gusets for 4 days and a school student visit in in July. At the end of the season the EGRIP camp will be closed down in a way that we can start up next year with a more extensive science program. * Femårig prosjekt til 12,5 mill Euro, Finansiert over Synergy-programmet til det europeiske forskningsrådet (European Research Council (ERC)). Oppstart august 2014. * Det eneste forskningsprosjektet i Norden som er finansiert av Synergy-programmet. Synergy-programmet er for store, vanskelige og sammensatte forskningsspørsmål innenfor alle fagfelt. * I prosjektet vil man hente inn nye og høyoppløselige data fra klimaarkivet man finner i iskjerner på Grønland, og i marine sedimentkjerner.